Coming up on three years since she launched Brewvana Brewery Tours, Ashley Rose Salvitti is finally feeling like she has her "poops in a group." That's another way of saying she's feeling really good about where her organization is headed for 2014. If you aren't aware, Brewvana provides unique tours of Oregon's beer landscape. "Getting our act together has given me the time to learn more about travel and tourism here, and the huge business potential," Ashley said. "There really isn't another city like Portland with so many small brewers. We're unique." 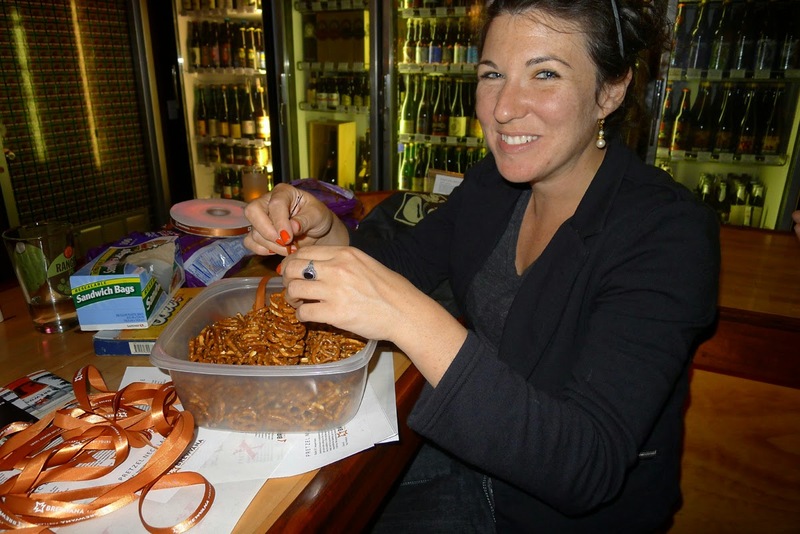 Ashley, who fled North Carolina seeking a better beer life in Oregon, launched Brewvana in April 2011. She was working at Hopworks at the time. She ran all the tours and did the marketing and admin work from her tiny apartment. Those were the days...may they never return. Arguably the most important thing anyone needs to know about Brewvana is that its leader has seemingly boundless energy. Ashley can talk about anything beer-related for hours. Along the way, she'll tell you about stuff she really enjoys: "I like to sip a good beer really fast." Sipping is clearly overrated. 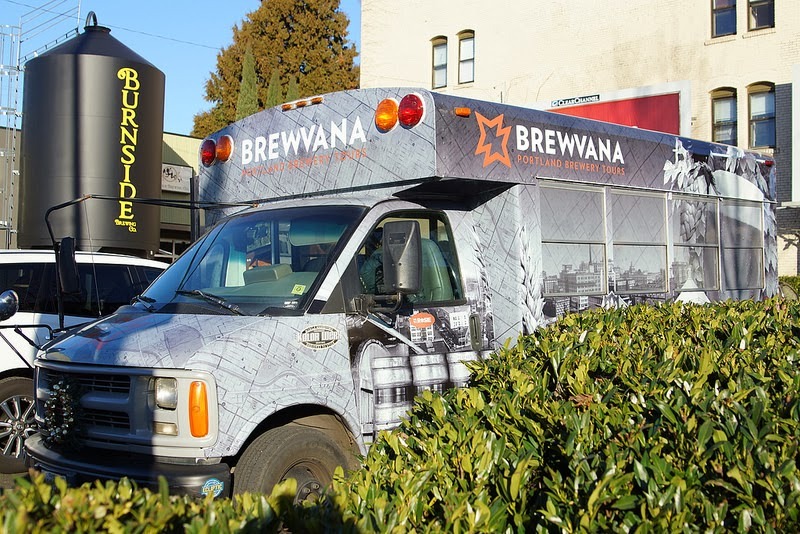 Brewvana's first employee came onboard in late 2011. They moved into an actual office in 2012 and Ashley left Hopworks to focus on her own business full time. Big steps. The ability to separate work from home was a big deal. After a slow start in 2013, things eventually righted themselves. Business nearly doubled over 2012. "Having a physical space and a set of business procedures really helped get the business moving last year,"Ashley said. "And that allowed me to invest some time in researching marketing angles. I spent time with Travel Oregon and Travel Portland. It's been informative and fun." Perhaps the biggest thing to come out of those relationships is that Ashley heads to New York with Travel Portland in March. She's part of a group of beer and other folks going to the Big Apple to mingle with media people. The goal is to share the Portland experience...the beer part of it in Ashley's case. "This trip came out of the blue and it's going to be amazing," Ashley said. "I've had to pinch myself a few times to make sure it isn't a dream." There's plenty more brewing at Brewvana. The most visible change is the new-look buses. 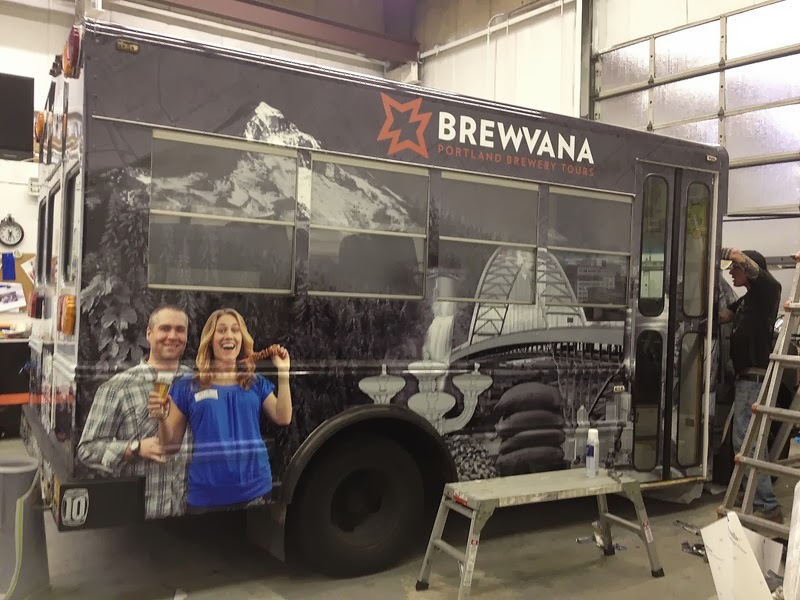 Angel and Rosie have been wrapped with high resolution graphics that tell the Brewvana story visually. The wraps were financed largely through an Indiegogo fundraiser and partly by sponsor dollars. 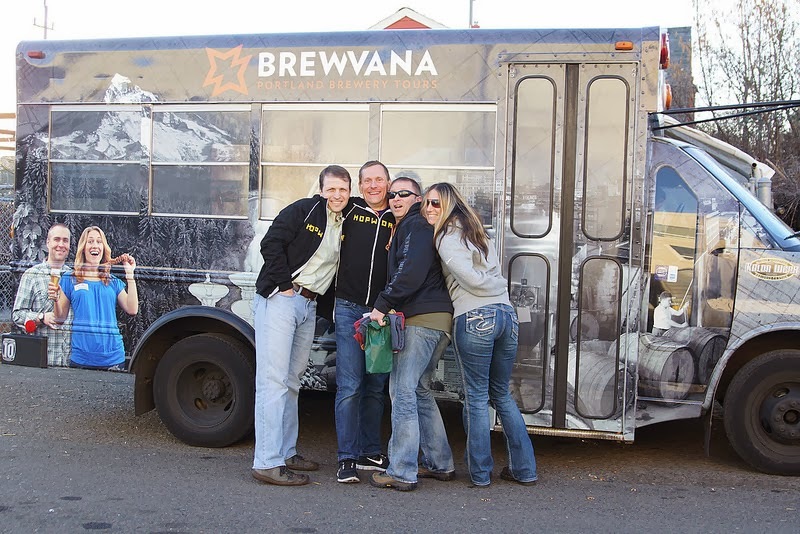 The message is clear: "This could be you having a great time on the Brewvana bus." "Nothing against the original graphics, but we really needed to convey a stronger sense of what it feels like to be on a tour," said Ashley. "That's the concept behind the pictures of people having fun with great beer in a great beer environment. It's a contagious message and the response has been totally positive." One of the things they expect to do more of in 2014 is custom tours. Regularly scheduled tours will still be part of the game, but custom tours for larger groups are the better revenue model. That will be the main focus. As an example, there's a potential weeklong tour of Oregon breweries for a group of 30 in September. That would be a huge step in the direction Ashley wants to go if it happens. "Doing larger tours is all about relationships," she said. "We've worked hard to establish relationships with the breweries, and we're now focused on building similar relationships with organizations that will help bring group tours. It's not something you can do overnight, but we've made good progress in the last year or so." In case you're wondering, Brewvana is not directly supported by the beer industry. They typically get discounted prices on beer, which would be available to any tour group. Sponsor dollars come from six breweries: Laurelwood, Widmer, Ninkasi, Coalition, Base Camp and Hopworks. That's it. They work with breweries to provide a great experience for tour patrons, but there is no linkage. 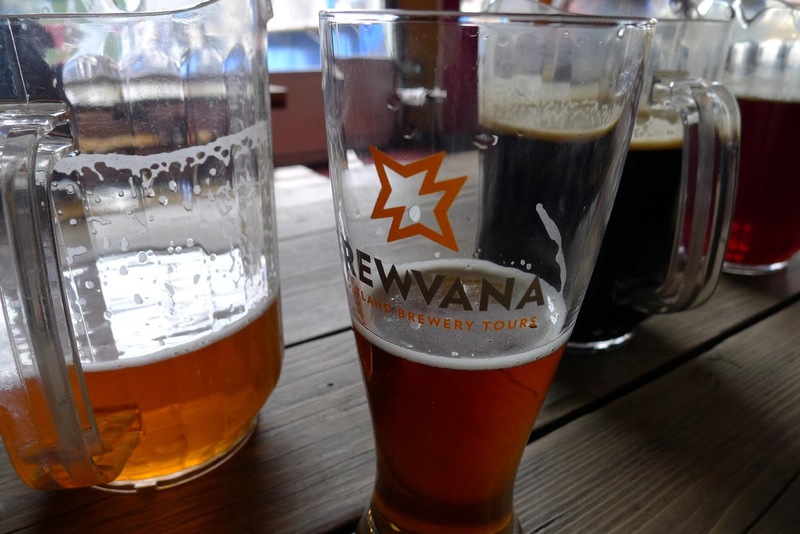 What is the future of Brewvana beyond 2014? It's hard to say. It could wind up being a concept that gets licensed to other Oregon cities. Not exactly as a franchise, but something like that. The one thing we know for sure is that more and more people are coming to Oregon to experience the beer scene. That means opportunity for Brewvana. The thing is, these kids really do know how to run a great tour. I've been on two of them and both were terrific experiences. If you haven't been, I recommend it. Given what they do and how they do it, the sky may well be the limit for Ms. Salvitti and Brewvana. They do seem to have their "poops in a group."